From claddagh rings to bands featuring Celtic knots, there are lots of beautiful Irish wedding sets to choose from. Whether you're looking for matching his and hers bands or a bridal set with an engagement and wedding ring, a perfect set is out there. For purchasing information, click on the "Buy Now" button on any of the following images. The claddagh is an Irish symbol featuring a heart, a crown, and two hands. It stands for love, loyalty, and friendship, making it the perfect choice for a wedding set. This beautiful 14k yellow gold bridal set includes an engagement ring with a round 0.80-carat diamond and matching his and hers bands with the claddagh symbol. It's a lovely choice and retails for about $900. A wishbone, or V-shaped wedding band works perfectly with the shape of the claddagh symbol. This beautiful and affordable bridal set features a sterling silver claddagh ring paired with a matching synthetic emerald and cubic zirconia set in a sterling silver wishbone band. It retails for about $60. Claddagh wedding sets don't have to feature gems or elaborate designs. These simple tungsten carbide bands for him and her feature a subtle etched claddagh design. This set of comfort-fit bands comes in most sizes and retails for about $40. Sometimes a simple braid can be evocative of Celtic knotwork. In this exquisite Celtic-inspired wedding set, a 0.50-carat round-cut diamonds sparkles atop a 14k white gold band of braided white gold accented with more diamonds. The matching wedding band is also braided with diamond accents. The set retails for just over $1,100. The trinity knot is another great choice for an Irish wedding set. Besides its religious meaning, a trinity knot can symbolize the past, present, and future. This gorgeous bridal set features 18k white gold engagement ring with a matching wedding band, delicately engraved with trinity knots. The set of two rings retails for about $1,500. You can also get two-tone contrast with durable materials like tungsten carbide. This pretty wedding set features his and hers bands in a silver tone with an elaborate silver Celtic knot design. The set of comfort-fit bands retails for about $40. A ring imbued with Irish culture is another unique choice. This sterling silver design features symbols of important points in Irish history, including St. Patrick, the Viking invasion, and more. 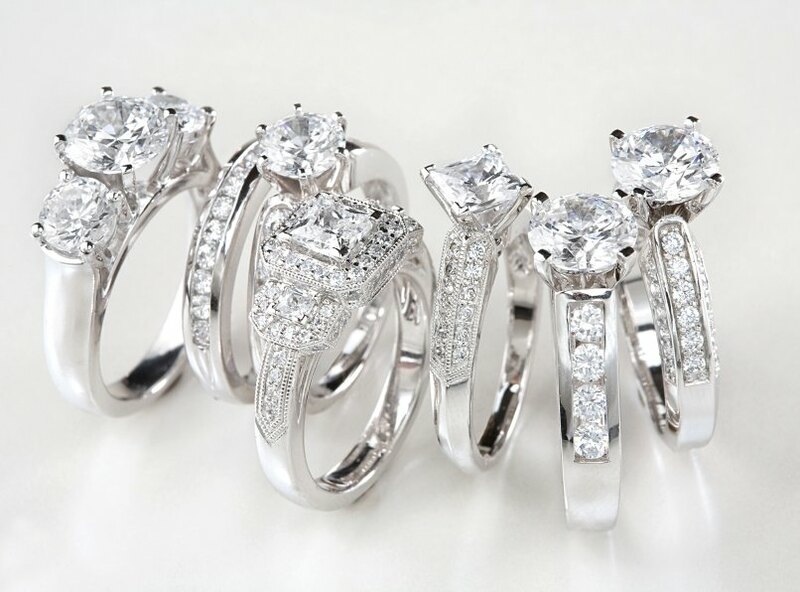 Purchase two rings at $155 each to create a matching set of wedding bands. Whether you're looking for a set featuring a Celtic engagement ring and coordinating band or a pair of matching wedding bands, there are many lovely options to choose from. Your perfect wedding set is out there waiting for you.